Ghosn at the the CES in Las Vegas where Nissan is showing Microsoft's voice-activated Cortana digital assistant. SEATTLE -- Microsoft is rebooting its push to sell software for cars with a new set of programs and services in a bid to keep up with rivals such as Google and Apple that are expanding in auto technology. "We're not getting into self-driving cars ourselves but we can be an important element of it by providing the platform," said Microsoft's business development chief Peggy Johnson, in an interview. 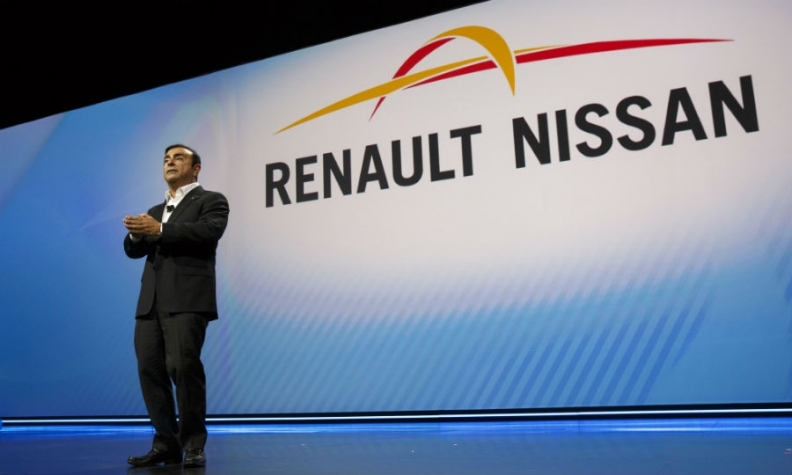 The Renault-Nissan alliance signed an agreement in September with Microsoft to work on car technology. The companies said Thursday that Renault-Nissan will be the first customer for Microsoft's Connected Vehicle Platform, which provides carmakers with a set of services built on Microsoft's Azure cloud. Available as a preview later this year, the system will collect sensor and usage data and help automakers build services that use that information along with Microsoft products such as Cortana, Office and Skype. While the Renault-Nissan alliance is the first customer for the new Microsoft platform, the software company has other carmakers trying or signed up to use its software. BMW plans to put Cortana in some cars, Toyota is using Azure cloud services for its connected car venture, and earlier this week Volvo said it will put Skype conferencing into some models. BMW will also offer models with Amazon's Alexa, which is popular in homes. Alexa will be in Ford cars soon, too. During the CES in Las Vegas, Nissan is showing Microsoft's voice-activated Cortana digital assistant used in a car for things such as scheduling a service appointment after the vehicle senses maintenance is needed. At a Thursday keynote address at CES, Renault-Nissan CEO Carlos Ghosn listed an array of efforts the company is making to move toward zero emissions and zero fatalities. The automaker chose Microsoft for its global reach, its familiarity with compliance issues automakers face, and its plans for making the relationship more valuable over time, said Ogi Redzic, senior vice president for connected vehicles at the Renault-Nissan alliance. "Microsoft has a top-notch cloud platform," he said. Nissan declined to say how many vehicles will use the software and by when. It's planning for more than 10 models with autonomous driving technology by 2020, but those won't necessarily all use Microsoft technology. Microsoft, the world's largest software maker, is trying to revamp its auto offerings around its Azure cloud service, Office productivity suite and Cortana. That's a big change from its previous strategy, which had auto manufacturers installing a version of the Windows operating system to run in-car entertainment and information systems. The change comes as carmakers try to turn their products into technology-packed, connected devices, rather than just gas-powered vehicles, while preparing for a future in which computers do the driving rather than humans. CES this year has been dominated by partnerships between tech giants such as Google and Amazon and automakers including BMW and Ford Motor Co.
Microsoft's new Connected Vehicle Platform comes three years after it lost Ford as a big customer of the Windows car product. This time, the company wants to be more flexible by offering carmakers only the software components they need rather than a fixed lineup, Johnson said. "We changed our strategy to be a much more open, inclusive strategy," she said. "The platform is open and you can use it in a broader way than our initial strategy." The Windows-based solution is still in millions of cars though, she said. Car data could support a $750 billion business by 2030, according to consulting firm McKinsey & Co. The promise from technology providers is that car companies can use software for everything from predicting when cars need maintenance, to better tracking of problems that lead to recalls and steering drivers towards local retailers. General Motors has a partnership with IBM's Watson division to mine vehicle data, figure out driver preferences and habits, and use that to direct people to gas stations, restaurants and other goods and services. Amazon has discussed using the Alexa digital assistant on its Echo home speaker to search for a nearby coffee shop and transfer the directions to Alexa in a car. Microsoft's Cortana can offer similar capabilities to recommend stops based on user requests, calendars or past behavior, Microsoft's Johnson said.